A dew claw is the term for a dog's extra thumb and toe nail. It is located at a higher position than the rest of the dog's nails, at the inner edge of its paw. 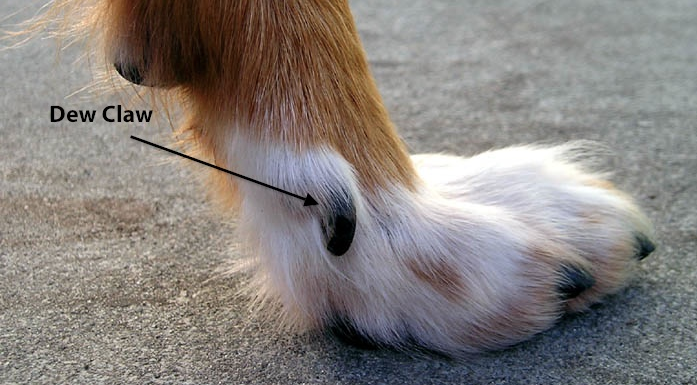 Dew claws hang from the foot of the dog and are practically of no use to the creature. In fact, if left to grow, it can actually bring harm to the dog, in the sense that this growth may cause trouble as it may get ripped off or caught on something during any physical activity and cause unnecessary injury and pain to the animal. Therefore, many breeders and owners prefer to have it removed at an early age, most preferably when the dog is a puppy. It is a simple, low risk surgical procedure performed by a veterinarian that involves the removal of the entire toe. Usually, the dew claw removal procedure is conducted when the puppy is 3-5 days old. At this age, the dew claw isn't fully formed yet and resembles a toenail more than it does an actual toe. Hence, removal is easy and this period of time is much preferred by breeders and veterinarians. Also, at this age it is possible to conduct the procedure sans anaesthesia and without any risks. In some cases, local anaesthesia may be used but, veterinarians or breeders mostly have it removed without anaesthesia. Adult dogs require full anaesthesia under supervision for the procedure which may involve certain risks. It is advisable to have dew claws removed when the dog is a week old. If the dog is fully grown and isn’t having trouble with his dew claws it is generally better to leave it be as it can save the animal a lot of pain because of extensive surgery.